About a year ago, having just picked up my first suit in this cloth from my tailor, I waited for the right day to wear it for the first time. That day proved to be an Indian summer one in NYC. Not cold but not hot, I walked around in comfort not worrying about the weather which might ordinarily cause me to work up a lather. At one point, I thought I had left my jacket at the office but I was wearing it. 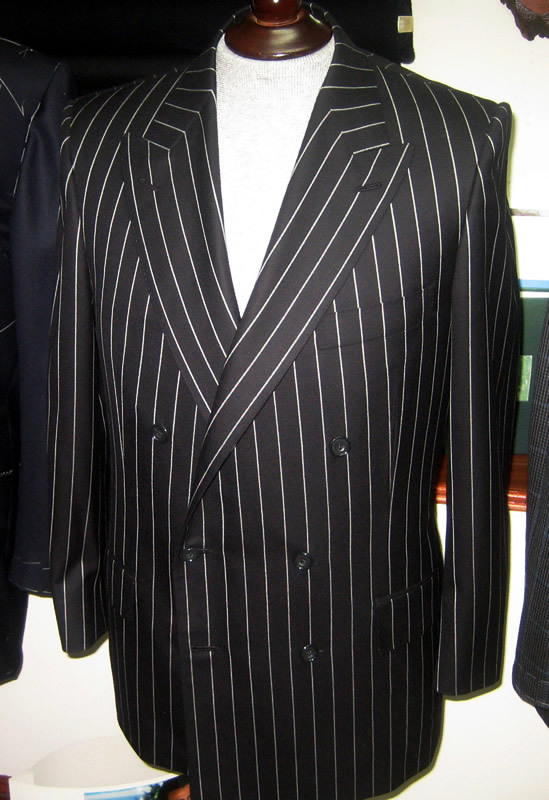 Part of the explanation is the skill with which my tailor makes a jacket but part of the reason was the lightness and smoothness of the cloth. Characteristics of Harrisons SUPER 150’s Grand Cru Special Reserve. This is the 2nd edition following the success of the initial launch of the quality in 2006. For this edition, Harrisons added another ten designs, including the two Pure Platinum ,and one 24 carat gold stripe, which are a little more expensive. 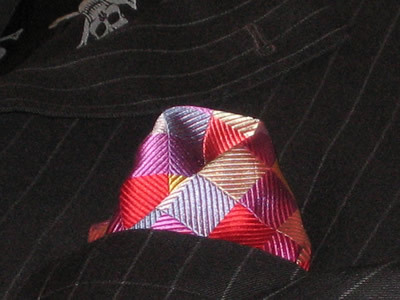 These patterns probably appeal more to Russian, Middle Eastern and people in entertainment. Same construction, same finish, and of course still 2 fold warp & weft…this gives the cloth not only a luxurious handle, but as importantly, it gives you great every day performance and wear. Many other makers super lightweight 150’s which are made with singles weft, and found in high end ready to wear garments also have a light, smooth feel but they wear out quickly and do not lend themselves to tailoring as well as Harrisons Grand Cru super 150s does. This where Harrisons use 2 fold warp and weft along with its tighter weaving and 11oz per yard weight really deliver a garment with long lasting smoothness and resiliency. 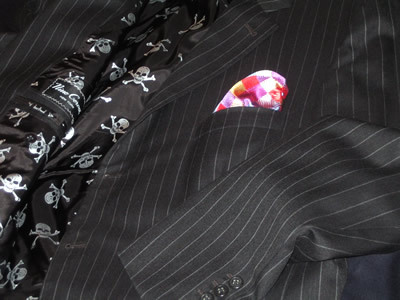 Harrisons make no bones about the fact that Grand Cru, as with all their qualities in the Harrisons ranges, are primarily targeted for tailors; these are the customers who understand how fabric works, not only during the making of the garment, but also how well the cloth will perform for their customers once they are actually wearing it. Film Noir Buff’s Personal observations. Construction is High grade yarn in all 150s quality, not flimsy, has body at 11 oz. but feels light as a feather on the body. Grand Cru doesn’t wrinkle much and the few that do appear shake out over night on a hanger. The cloth shows no signs of bagging or pulling. 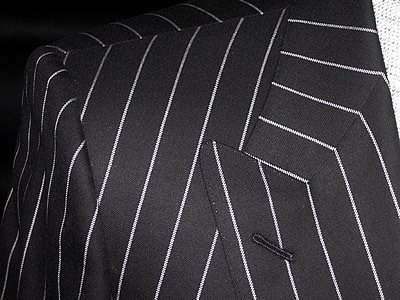 Fabric feels cool and smooth against the skin which means that this fabric, in spite of its 11oz weight, rarely makes the wearer hot or uncomfortable. And, if you lift weights, the softness of the cloth will yield to your Monday morning triceps expansion. The cloth also takes the dye well for a rich, even color/shade. There are still not enough stripes in the collection. 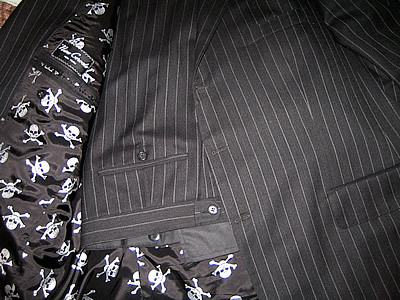 However along with several narrow pinstripes in several colors on grey, navy and black backgrounds there are a navy and a charcoal with a medium resolution chalk stripe (charcoal version pictured with skull+crossbones lining) and a very distinct white rope stripe on a navy, black or dark grey background (black version shown with double breasted jacket). 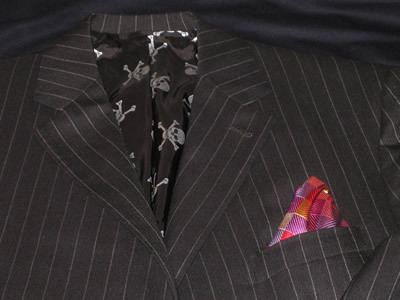 This cloth has a very impressive look for business or for casual suits worn for dressier events. It is an excellent value and costs no more than any other woolen merchants’ super 150s cloth. My tailor, Nino Corvato, rarely raves about a cloth. 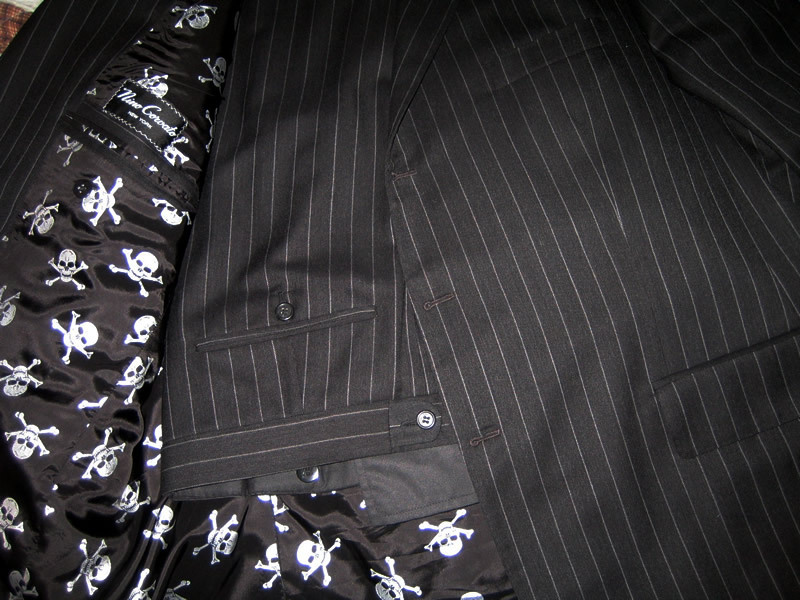 This is partly because he works with so many nice cloths. 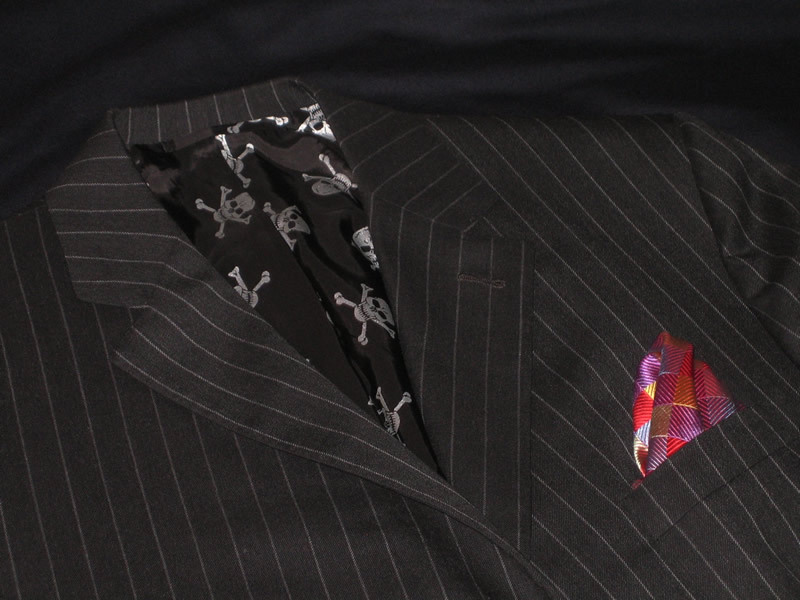 However he continually sings the praises of this Harrisons super 150s cloth as one of the best he has ever worked with. He claims that it is a dream to work with. In his opinion the overall look of the cloth from a construction and finish perspective is that it is excellent, professional and has a current look.